This should just about wrap of this year's position players. We'll put off to another post any speculation regarding how many, if any, we think might be coming back. Alvin Colina (28). 2010 was his fourth year as a AAA catcher. Last year he was with Gwinnett. Played in 51 (201 plate appearances) games with the Bulls before blowing out a knee on July 22nd. 7 HR, 28 RBI, .231/.279/.390, wOBA .274, bRAA -7.3. Postions played: C-37, DH-13. As with Jose Lobaton, we find it hard to evaluate a catcher from the stands. Nevertheless, we find a lot to like about Mr. Colina. He appears to handle pitchers well and he appears to handle younger catchers well. We haven’t had an update on his condition since July, but we would not mind seeing him back with the Bulls next year. Ryan Shealy (30) played 48 games at first base and as a DH for the Bulls before opting out in June. Decent numbers, wOBA .373, bRAA 6.5. He helped the Bulls get off to a good start. He went to the Pawtucket Red Sox, got in a few games with Boston, went back to Pawtucket, and was released in early August. Stats. 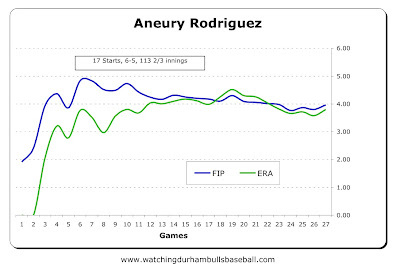 Dioner Navarro (26) showed up in Durham in late June and left the beginning of September. Apparently struggling as the Tampa Bay Rays starting catcher, he came to the Bulls for the opportunity to sort things out. And pretty much did. Played in 43 games (169 plate appearances) during his stay. 2 HR, 21 RBI, .284/.387/.390, wOBA .369, bRAA 4.6. Positions played: C-35, DH-7. We don’t expect to see Dioner back any time soon. Good catcher. Certainly an asset to the Bulls while he was with us. The best numbers of any of the Bulls’ catchers. He is likely to be remembered for his first game as a Bull when he took a 102 mph fastball from the then Louisville Bat (now Cincinnati Red) reliever Aroldis Chapman. 40 games (149 plate appearances). 1 HR, 9 RBI, .291/.306/.369, wOBA .315, bRAA -2.7. Positions played: SS-26, 2B-12, P-1. Luna played at three levels this year, the Stone Crabs, Biscuits, and Bulls. As much as he was around this year, he didn’t make much of an impression until the end of the season. Then he was terrific. He’s young and looks pretty good on the field. Not much of a bat, however. Would imagine he’s got a good shot to start either in Montgomery or with the Bulls next year. Rashad Eldridge (28). As in 2009, outfielder Rashad Eldridge spent time with the Bulls and Biscuits. 34 games (124 plate appearances). 1 HR, 3 RBI, 20 runs scored. .215/.309/.308, wOBA .297, bRAA -4.2. Positions played: RF-17, CF-2, LF-17, DH-1. Montgomery’s center fielder has, I think, run out of time. He is a very good outfielder and has decent speed. He seems to be pretty much stuck at the AA level, with an occasional callup. Leslie Anderson (28) joined the Bulls in August after stints with the Stone Crabs and the Montgomery Biscuits. 30 games (129 plate appearances). 2 HR, 12 RBI, .328/.359/.418, w0BA .338, bRAA 0.2. Positions played: LF-16, 1B-9, RF-1, DH-4. Cuban defector Leslie Anderson was being touted as a candidate for the Rays Carlos Pena’s job when he was signed. We don’t think so. He does bat for average, and, so far, doing pretty well. The question would be, at his age, is he on his way up or down? Hank Blalock (29) played 26 games, went up to the Rays, and went on his way. Matt Joyce (25) played 25 games with the Bulls and it now looks like he is finally sticking with the Rays. About time, we’d say. Rocco Baldelli (28) was in 11 games, Rays catcher Kelly Shoppach (30) visited for 4 games while rehabbing, as did shortstop Jason Bartlett (30) for 1 game. Another outlier was pitcher Bobby Livingston who DH’d twice. Catcher John Jaso (26) started the year with the Bulls, but went up to the Rays in April and stuck there. Good for him. That brings us to four interesting guys from whom we are going to have to pick this year’s Moonlight Graham Award. Catcher Nevin Ashley (25) came up from Montgomery for 7 games in the regular season and 5 more in the postseason. There is a lot of potential in this guy even if his hitting was not stellar while with the Bulls. Stats. Catcher Craig Albernaz (27) only had one regular season game, but 4 in the postseason. We have always like Albernaz. Maybe he’ll spend a year with us next season. Stats. 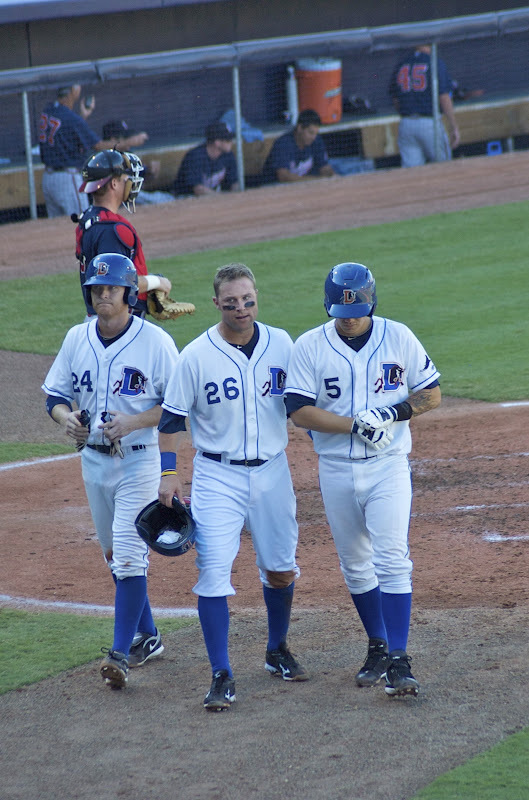 Catcher Kyle Holloway (22) in his first professional season had 4 games with the Bulls at the end of the year. Not much of a chance of seeing him again for a year or two. Stats. Outfielder Emeel Salem (25) had three games with the Bulls when they were playing Gwinnett. We speculated at the time that his visit might have had as much to do with proximity to Montgomery as the fitness of the Bulls outfield crew. Stats. A careful reader has let us know about a local sports blog — Capital Sports Report — that has put up a poll asking for Favorite North Carolina-Based Professional Sports team. The Charlotte Knights, Asheville Tourists, Greensboro Grasshoppers, Hickory Crawdads, Kinston Indians, Winston-Salem Dash, and the Burlington Royals aren't on the list, but the Durham Bulls are. So, if you're interested, click on the link and let them know that there's lots of Bulls fans around here. Time to finally getting around to wrapping up the season. Let's start with the position players, listed in order of number of games played. This is going to take a number of postings to get through, but the look back is fun. Justin Ruggiano (28). With Bulls since 2007 (4 seasons). Numbers up from 2009. Strikeouts down. On Rays 40-man roster. Tied for most games (117), led in plate appearances (507). 15 HR, 70 RBI. 24 SB, BA/OBP/SLG: .287/.357/.453. wOBA .344. bRAA 3.4. Brief visit with Rays. Don’t think he had an AB while there. Post-season: 9 games, 1 HR, 6 RBI, 1 SB. Positions played, regular season: RF-63, CF-29, LF-26, DH-3, 3B-1 (2 errors on year). Justin has been on the Rays’ 40-man for a couple of years and has yet to be given an honest shot at playing for the Rays. At a guess, assuming the Rays let him go, he will be looking for employment elsewhere. Defensively, he is among the best we saw this year on any team and he is very fast on the bases. 70 RBI are nothing to sneeze at. He’s got the tools to be attractive somewhere else. But maybe he likes the Rays system. Chris Richard (36), also with the Bulls since 2007. Numbers in every category up from 2009. Played 117 games in the regular season and accumulated some striking numbers. 20 HR, 79 RBI, 39 2B, .300/.390/.535, wOBA .395, bRAA 24.6 (!). Positions played: 1B-82, DH-25, LF-10, RF-1. Chris is under-rated as a first baseman. He only had 4 errors on the year (down from 7 in 2009) with a fielding percentage of .995. I don’t know how to chase it down, but I suspect he has to be among the best, if not the best, first baseman in the International League. His only competition might be 20 year old Freddie Freeman with the Gwinnett Braves who had a fielding percentage of .994 in 111 games at first, but he’s 16 years younger than Chris! What is Chris going to do? He seems to like it here in the Triangle. He sure is physically fit enough to play baseball with the youngsters. On the other hand, you’d think the local universities would be anxious to have him on their staff, or maybe a place somewhere in the Rays coaching system. Guess in this era you don’t have player/coaches. My hope is that he and the Rays can come to an agreement for another year. Fernando Perez (27), with the Bulls almost all of 2008 (129 games), did not play most of 2009, numbers down in every category from 2008. On the Rays 40-man roster. Played 116 games with 426 plate appearances. 4 HR, 32 RBI, 24 SB, .223/.280/.299, wOBA .269, bRAA -24.2. Positions played: RF-43, CF-33, LF-42. By any measure, Fernando had an awful year. You have to think that he and the Rays will be coming to a new understanding over the winter. For those of us who enjoyed, actually thrilled, at watching him play in 2008 he is not the same player. A lot has changed, of course. He was working on his switch-hitting in 2008, but that has gone by the board. We can’t tell from the stands if his injuries of 2009 are still bothering him. What we can see is that his swing has been off all year and the sheer exuberance he seemed to show is not obvious to us in the stands. I’d guess that there’s a less than 50-50 chance that he’ll be back next year. But I sure would like to see the Fernando Perez of 2008 in a Bulls uniform again. Angel Chavez (28), 2010 his first year with the Bulls. Numbers up in most categories. To oversimplify a bit, Angel started the year at shortstop and moved to third base after Hank Blalock moved on. He shared time at both positions with Elliot Johnson (SS), Dan Johnson (3B), and J.J. Furmaniak (SS). Chavez is a very good baseball player and he made major contributions to the team. About the only blemish on his record this year was his unfortunate tendency to hit into double plays. But that has to be something of a statistical anomaly or possibly a function of his place in the batting order. He doesn't seem to have great range and yet if the ball is near him he makes the play. An oddity was that he often didn’t seem to be playing all that hard and yet somehow the ball always got to the first baseman ahead of the runner. He doesn’t seem to be on anyone’s prospect list, which means that, if the Rays don’t have some hot shot infielder coming through the system, he might be back next year. If only for his fielding skills, we hope the Rays take a close look at Angel. Elliot Johnson (26), with the Bulls since 2007 and on the Rays 40-man roster much of that time. Passed through waivers and signed minor league contract this year. By any measure, 2010 was his best season as a professional baseball player. Played in 109 games with 481 plate appearances. 11 HR, 56 RBI (5th best), 30 SB (2nd best), .319/.375/.475, wOBA .373, bRAA 14.8. Positions played: SS-64, 2B-16, LF-21, RFK-14. Back in 2008 we were unimpressed with Elliot’s play. In 2009 it seemed as if he spent a lot of time injured. But he sure blossomed this year. He won all sorts of awards, and deserved them. As a shortstop he seems to depend on his glove and his arm, and they serve him well. What was important to the Bulls this year was to have such a solid, dependable, and well above average player available to play so many positions. He hit with some power, got on base, and moved around the bases. His 72 runs scored was 3rd best on the team. My guess is that this was his last year as a Bull, and I regret that. Elliot’s off to play winter ball in Mexico and, I’d bet, to eventually sign a contract with an invitation to spring training with a very solid shot of playing in the majors next year. The oddity is that he’s a better ballplayer that some currently with the Rays (Jason Bartlett and Willy Aybar come to mind), but he’s not going to get a chance to prove it. We’ll try to keep an eye on him this winter. If the idea was to break the hearts of the Columbus Clippers, then the Bulls gave it their best shot. Clippers’ pitcher Yohan Pino was was brilliant. With the exception of the 5th inning, Bulls hitters were being set down on three or four pitches. In eight full innings he faced only 28 batters and threw only 81 pitches. And in almost every inning Columbus was threatening. They got runners to third base in the 1st, 2nd, and 3rd innings, but could not push across a run against Alex Cobb. Nevertheless, even though Bulls hitters were swinging at everything, it wasn’t until the 5th that they were able to score. Angel Chavez got a double. Rashad Eldridge singled Chavez home (and got to third base on a fielding error) and Eldridge came home on a sacrifice fly by Fernando Perez. That put the Bulls up 2-0. R.J. Swindle baffled the Clippers in the 5th and 6th, all except Wes Hodges who smacked a homer over the bull. But Joe Bateman struck out the side in the 7th and all seemed well. Perhaps just to extend the agony, Joe let a run sneak in in the 8th for his first blown save of the year. The game was tied 2-2, setting the stage for Winston Abreu to get his first win of the year. Winston struck out the side in the top of the 9th. Bring on bottom-of-the-9th heroics. Josh Judy came in for the Clippers. Elliot Johnson worked a walk. Justin Ruggiano hit a single to right that was deep enough for Johnson to get to third. That led to an intentional walk of Chris Richard, loading the bases with none out. Infield and outfield were drawn in, but Leslie Anderson’s fly out to center was just far enough to let Elliot get home. The Bulls live to see another day. When Xavier Hernandez strolled out to the mound in the 6th inning just to stall a bit while Joe Bateman warmed up I had this thought. "This could be the last time he does that." But with the win, X will get another chance to make that stroll at the DBAP. Sure seems like Columbus thoroughly scouted the middle of the Bulls lineup. Elliot Johnson, Justin Ruggiano, Chris Richard, and Joe Dillon are not doing well. Maybe the fun they had in 9th will be a turn around moment. Paul Phillips, who got a win for the Bulls in Game 4 of the Bats-Bulls series is reported to be starting tomorrow. We were surprised to see that Stacy Long, a writer for the Montgomery Advertiser, and who does a terrific job covering the Biscuits, was in town. His blog has several notes from the game and some post-game clubhouse commentary. ... momentum is only as good as the next day's starting pitching. Sounds good to me, Charlie, 'cause things are beginning to look a bit worrisome. As a crew, Bulls pitchers usually don't give up many home runs, but they've given up 7 in the last two days. Down in Montgomery, Alex Cobb (tonight's starting pitcher) only gave up 7 in 119 innings. So perhaps that aspect of the game might be under control. And then there's the fact that only once in this entire season have the Bulls lost three games in a row to the same team (Toledo, May 15-18). So all isn't lost. But worried? You bet. The Bulls need to win three in a row. The Bulls have done that 8 times this season, most recently against Norfolk August 22-24 (actually that was the last three of a six in a row run, but who's counting?). We'll be there tonight. This could be the last game of the season for Bulls fans and no matter what happens it has been a lot of fun. Great baseball. Great fans. Speaking of great baseball, Dan Johnson finally showed the Tampa Bay folks what he could do last night when he hit two two-run homers to score all the runs in a 4-3 win over the Yankees. And lastly, in an absolutely unrelated to baseball bit of trivia: If you have been wondering 1) Who the heck Miranda Lambert is and/or 2) what those songs playing in every game delay on the video board were actually about, then these two links will more or less explain. How bad was it? Here's a clue — Omar Luna pitched the 9th 8th inning. How bad was it? Another clue — Four out of five Bulls pitchers gave up home runs. How bad was it? Final clue — For the first time this season, the Raleigh News & Observer put a Bulls game on the front page. I'm not enough of a sadist to give any masochists out there any more pleasure. Instead, I think we will mention the three double plays, Justin Ruggiano's grand slam, and our wonderment at umpire Chris Conroy throwing Richard De Los Santos out of the game. Deliberate? Really? What game were you watching? Meanwhile, down in St. Pete the always mysterious manager of the Rays, Joe Maddon, gave Jake McGee his introduction the the major leagues in the 5th inning with runners on first and second and two outs. Not a good start. McGee walked the bases full and walked a runner across before striking out Derek Jeter. He walked the first batter he faced in the 6th and was taken out. The first thing to say about last night is the huge thrill we all felt when Chris Richard hit his grand slam in the 4th inning. Seeing all those white uniforms running around the bases, Chris' huge grin as he came across the plate, that was one of the best moments of the year. Thanks, Bulls! The moment where the Bulls offense won the game, however, came an inning earlier when it sure looked like Bats manager Rick Sweet outsmarted himself. JJ Furmaniak led off the 3rd with a triple. JJ by the way had a quite a night: on base four out of five times with three walks, a triple, and two runs scored. With Furmaniak on third with no outs and the score 1-0 Bulls, Johnson grounded out third to first. When Justin Ruggiano came to bat the Bats infield stayed at normal depth; however, when the count reached two strikes Sweet called the infield in. Just why he would do that on two strikes and not at the beginning of the at bat, I've no idea. But it didn't work. Instead, Ruggiano got a single right past the pitcher that brought JJ home. Two more runs were to score in that inning and Richards' grand slam in the next inning put the game away. In the meantime, other things were afoot. We saw some terrific pitching by Paul Phillips, Jake McGee and Dale Thayer. When the rains came the 2,800 folks didn't budge from the DBAP, although a few joined us up under the eaves. The "veterans" (Johnson, Ruggiano, Richard, Dillon, and Chavez), who had been somewhat quiet so far in the series, had a great night. Well, may not Joe Dillon, but the rest did just fine. Elsewhere, the Columbus Clippers won their first-round matchup with the Scranton/Wilkes-Barre Yankees. So the winner of today's game will go into the Governors' Cup finals in Columbus on Tuesday evening. Adam Sobsey has an interesting speculation near the end of his Triangle Offense piece. He notes that Biscuits infielder Drew Anderson and Biscuits reliever Dane De La Rosa have been leaning against the dugout rail for the last week. He speculates that the Rays are considering calling up both Jake McGee and Elliot Johnson. Not sure I agree. McGee, maybe. Johnson, don't think so. If for no other reason than they'd have to push someone off the 40-man. This is a big deal! Today! Note the time — 5:00 at the Durham Bulls Athletic Park. Bulls vs. Bats for this round of the playoffs. Otherwise, as great as it has been, the season is over. By now the Bulls have finished their trek across the Appalachians. Here’s hoping that all of them (excepting the drivers) got a sound sleep before reaching Durham this morning. 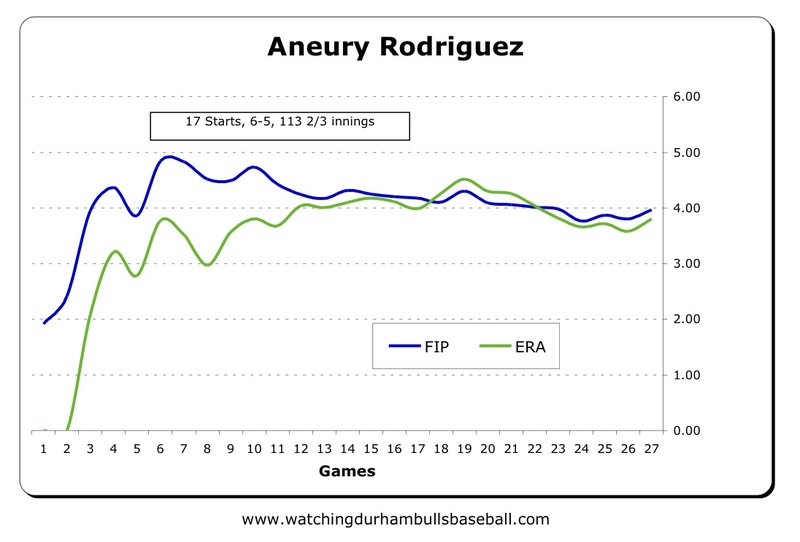 Aneury Rodriguez certainly was not on his game last night. Very quickly the contest became very like one of those “committee” starts we had during the regular season, with each pitcher taking a couple of innings. Darin Downs was certainly the hero as he came on in the 3rd with the bases loaded and got the fly out to deep right field. The Bulls had jumped out to a 3-0 lead in their first two at bats. Five singles in the 1st inning got two runs in. Two walks and a single got another run across in the 2nd. The Bats did get a run in the troublesome 3rd. When the Bulls made two egregious base running mistakes in the top of the 4th (by Fernando Perez and J. J. Furmaniak) and the Bats scored another run in the bottom of the 4th (bringing the game to 3-2 Bulls), the game was in the balance. The top of the 5th sounded just like the Bulls we know and love. Justin Ruggiano led off with a double. A Chris Richard single sent him to third. Joe Dillon singled Ruggiano home and sent Richard to second base. Leslie Anderson did hit into a double play, but Richard got to third base and he scored on a wild pitch while Angel Chavez was at bat. The Bulls were ahead 5-2. After that, the Durham relief corp really hit their stride. Downs had a clean bottom of the 5th. Jake McGee came on in the 6th and faced just seven batters in the next two innings, striking out three. Joe Bateman struck out the side in the 8th. Winston Abreu had a 1-2-3 9th. Meanwhile in the 8th Angel Chavez got his first hit of the series, a double, and drove home Leslie Anderson, making it 6-2. Tonight we get to see Biscuit starter Alex Cobb. He’s got some very good numbers (ERA of 2.71 in 119 innings). Looking forward to seeing him. A bit of catch-up here. Neil Solondz has had some very good interviews leading into his broadcasts on recent nights. First is Xavier Hernandez reflecting on his time with the Bulls and his career. Then Charlie Montoyo talks a bit about the playoffs. Finally, Bats manager Rick Sweet talks about his team. Speaking of the playoffs. The Yankees evened up their series with the Clippers, so they and the Clippers motored over to Pennsylvania to continue their end of the playoffs. Since their arrival "up there" the Rays have played a grand total of seven games and have had two days off. They had a home game on September 1 and then flew to Baltimore for three games, to Boston for three games, then on to Toronto for a game to be played tonight. During that same stretch the Bulls have played eight games and made the trek to and from Louisville by bus. And the new guys haven’t had to work very hard, appearing in only three games each. Not only that, it isn’t as if they had to do much running of the bases. Gotta admit, pretty good life. But that’s OK. What we are interested in is tonight’s game at the DBAP. Here’s hoping that we get a better turnout than the 3,000 who showed up at Louisville Slugger Park last night. Several items I didn’t want to get by without comment before we start obsessing about the playoffs. Before last night’s game started several Bulls were called out for the Goodman Awards and it was a fine and apt selection indeed. Chris Richard’s recent fine play was noticed by the International League and he was named Player of the Week for the final week of the season. In that regard, Chris’ final batting average of .300 on the year helps explain why he left the game a bit early last night. He was at exactly .300. Why take a chance? 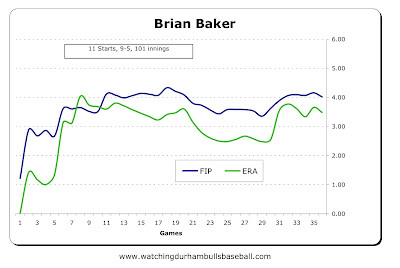 (Even better, from a stat geek's perspective, was his wOBA of .396 and bRAA of 24.6, the best on the team). And last, but certainly not least, thanks to RaysIndex we noticed that Baseball America has named Jeremy Hellickson as Minor League Player of the Year (note, not pitcher of the year, player of the year). The Baseball America article by J.J. Cooper is terrific. Congrats to Jeremy. The last regular season game of the year is at one o’clock today. Look for a few unusual moments. But before that, let’s savor last night’s win. Wasn’t that game fun? Great weather. Decent (not great) baseball. And a win. Who were the offensive heroes? Who other than Elliot Johnson, Chris Richard, and Joe Dillon? Who was the pitching hero? Joe Bateman, of course. 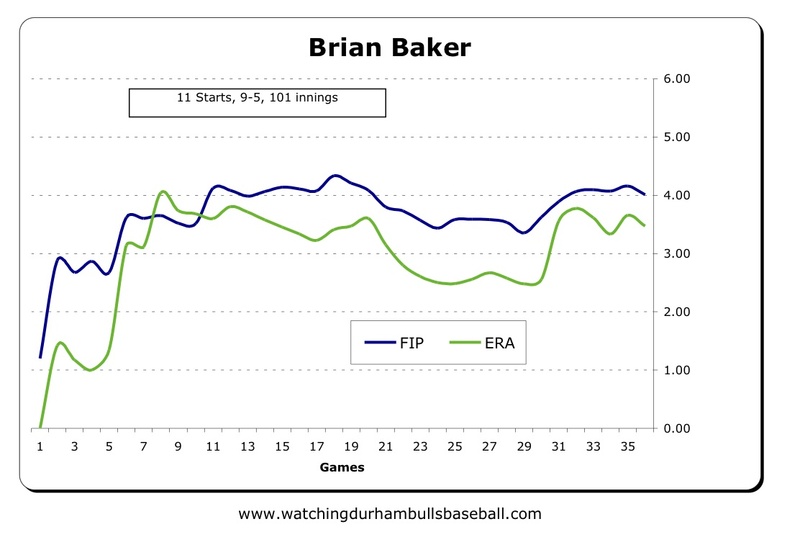 In the not-great category was Brian Baker’s pitching. He just looked like he had run out of gas before he got on the mound. And that may be the case. Over at Triangle Offense Adam Sobsey is reporting that Baker may be done for the year. Since it looks like Ramon Ortiz is also out for the year, I may go back and delete my post about the playoff starting rotation. Brian let five runs in on 7 hits and 4 walks. The Bulls were down 5-3 when he left. Also in the not-great category was Brian Shouse’s appearance. But he didn’t let any runs in. We are finding it hard to believe that he is still on Maddon’s short list for a lefty specialist. In the great fun category was watching Omar Luna play shortstop. He wasn’t going to let anything by him last night, and he didn’t. Our opinion is that, after pitching, defense will be the key to the playoffs. Feeling good about having Mr. Luna around. And then Elliot Johnson came to the plate in the 8th with Fernando Perez and J. J. Furmaniak on base (he and Chris Richard had hit back-to-back homers in the 1st). Elliot whacked a triple and the game was tied. Joe Dillon hit a sac fly and the Bulls were ahead. Joe Bateman stayed in for one...more...inning (his 76th on the year) and the Bulls had a win. Game note: Justin Ruggiano and Angel Chavez were out for another game although Justin came in on defense in the 9th, and Angel was warming up to pitch the 9th until Elliot’s heroics changed the equation. Looking back to last year’s last game is interesting. Note that last year the Bulls played 144 games but this year a rainout on the road meant that one game simply didn’t get played. The Bulls started the game using the same bat. Don’t remember when or if it finally broke. 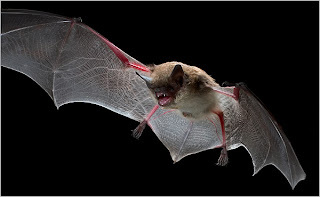 They were using Jon Weber’s bat, which gives me a bit of a twinge. Checking out the lineups a couple of familiar names jump out. Elliot Johnson was at shortstop, Michel Hernandez (now with the Tides) was the DH. Joe Dillon and Justin Ruggiano were getting a day off. Chris Richard had just been called up to the Rays. Joe Bateman appeared in relief. Desmond Jennings, Matt Joyce, and Sean Rodriguez from the last year’s starting lineup are now with Rays. The Bulls still don’t know who will be their opponent on Wednesday. So let’s have some fun today and then wait and see. You know things are going to be a bit odd when you come through the gate, take a look at the lineup cards, and see Bobby Livingston batting DH. Livingston? A pitcher? How come? Probably a couple of reasons. The Bulls are short of position players (usually have 12, now have 11 on the list). Then Angel Chavez and Justin Ruggiano got banged up on Friday night. That meant the Bulls were down to a choice between catcher Kyle Holloway or a pitcher. Which leaves me with this image in my head (probably not fair, but it’s there) of Bobby Livingston jumping up and down on the bench, waving his hand and saying, “Send me in coach! Send me in!” I’m guessing he likes to hit and he’s spent some time with National League teams so he isn’t a complete stranger to the craft. But that was before the game started. 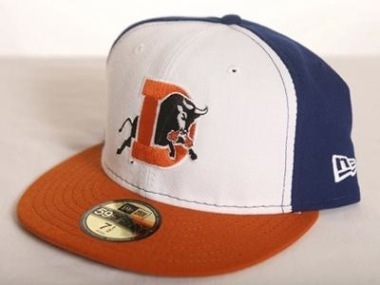 The oddness continued into the first inning when with just one out the Bulls were down 4-0, Ramon Ortiz had left the game, and Dale Thayer was taking warmup pitches. (Note: no word on Ortiz’ problem/condition). After that it was a glass half-full/half-empty kind of game. I’ll take a mostly half-full look. 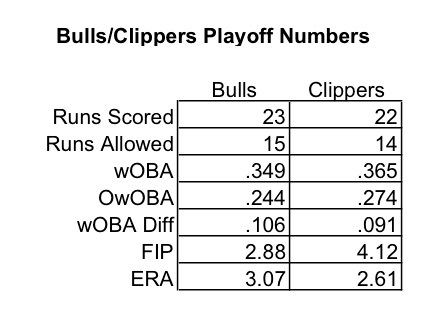 The Bulls went through five relief pitchers and they mostly did just fine. Notable was R. J. Swindle’s two innings. He looked a lot like the guy we were seeing until recently. Here’s hoping he keeps it up. Dale Thayer didn’t look all that good, but not bad either. Winston Abreu can’t go two innings. Charlie knows it. Winston knows it. But what else was he going to do for the 10th, put Angel Chavez in? Well, that apparently was what he was going to do before the Bulls got within a run in the bottom of the 8th. Chavez was warming up to come in for the 9th, but then sat down and Winston Abreu started warming up. New guy Kyle Holloway had his moment when he came in for Bobby Livingston (0 for 3, by the way), hit a double, then score the tying run in the 9th. On the half-empty side of things, Leslie Anderson doesn’t seem comfortable at the plate or in the field. Did he really think he’d be playing for the Rays in September? Is that what’s going on? Hard to tell. Nevin Ashley gets to be the goat since he was the catcher of record for the wild pitch that allowed the winning run, and got the last out with a runner in scoring position in the 10th. Nevertheless, the Bulls did well to just get back into the game after that awful first inning. Now, what are the Rays going to do about our lineup? Even if Ortiz and Shouse are moved off the current roster, there’s still only room for one pitcher, and that will need to be a starter. The Biscuits’ loss last night put them out of the Southern League playoffs, but not sure who down there will be a help. But if there’s a choice, my vote is for defensive skills (let’s not give away a playoff game) among the position players and craftiness among the pitchers. If you haven’t noticed, broadcasts of the games seem to have been switched to 99.9 FM for the last couple of days. And today’s game is at 5:00. Wasn’t that a wonderful night for baseball? Great crowd. Perfect weather. To be specific, on April 7, 2011. 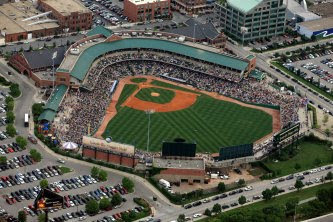 The first game of the 2011 season is at Gwinnett. Over the years the Bulls have had a very competitive relationship with Gwinnett (née Richmond) Braves. This year has been no exception as the Bulls/Braves matchup ended very much in favor of the Braves at 9 games to 12. Here at WDBB we haven’t followed the Braves closely enough to make a guess as to why the rest of the season was not more successful for them. Certainly when they’ve been in Durham they have been a very good team (much like the Louisville Bats). Maybe it’s the Blue Monster. Last night the numbers tell most of the story. Bulls pitching gave up 15 hits (including 2 doubles and one home run), 4 walks, and only managed 6 Ks. Braves pitching gave up 11 hits (all singles), no walks, and had 11 Ks. Hard to win games with those kinds of differences. The Bulls did stay close, however, until the law of averages caught up with Jake McGee. (But for his first ever Triple-A run to be walked in? And for that run to be the difference in the game? That’s gotta hurt.) And then, of course, Brian Shouse gave up the insurance run. Adam Sobsey's lengthy essay has some interesting thoughts on the season, with comparisons to 2009, and a look at AAA management, near the end of his piece. Also, he reports that Angel Chavez is OK. Very good news. I know that the differences between Bulls new guy, catcher Kyle Holloway and Braves new guy, third baseman Dan Nelson are probably greater than their similarities. But otherwise I’d have to spend time on how three members of the Bulls relief corps (R. J. Swindle, Dale Thayer, and Brian Shoushe) have put together six (two each) crummy appearances over the last couple of games. So let’s talk about the new guys. Kyle Holloway is the ninth (!) catcher to put on the gear for the Durham Bulls this year. Although it is true that several of those put in very brief appearances (Albernaz - 1, Dillon - 1, Jaso - 3, Shoppach -2), the fact is that the Bulls have had problems at the position in 2010. Four or five is the norm. In addition, Mr. Holloway is ridiculously new to the game. His career began on June 20th. He had 73 plate appearances in professional baseball before last night, all in A or Rookie League. He teams up with Nevin Ashley who is the senior member of the Bulls catching corps with three games in AAA baseball. So, how’d he do? Pretty good. At first it looked as if pitches were being called from the dugout. I’m not sure whether or not that continued since I got caught up in the game, but that makes sense to me. Two bases were stolen, but by the best base stealer in the International League, Gwinnett’s Matt Young. And Holloway threw Young out on his third try. At the plate he got a key double and scored a run in the Bulls four-run 5th inning. He worked five pitchers he’d never seen before, including catching 41 year old Shouse. Holloway is 22. Sort of like playing catch with your dad. Field of Dreams role reversal? Darn good Triple A debut. More about Mr. Holloway at the Triangle Offense link at top (scroll to the end). Gwinnett’s third baseman Dan Nelson was also having his Triple A debut, but his path was a bit different. He is 26 years old and has been banging around A ball since 2004, making it to AA just this year. So what did he do last night? In his second AAA at bat he hit a key three-run homer. He also made a couple of critical and very pretty plays at third base. He sort of won the game for the Braves. As worried as I am about the Bulls catching situation, I looking forward to watching Ashley and Holloway over the next couple of weeks (as if I had a choice) and, as a fan of seeing guys get their chance, here’s hoping that Mr. Nelson keeps it up (just not in such a timely manner if he doesn’t mind). The issue of who the Bulls will play next Wednesday is not yet settled, but I’m happy to pass on the word that if it’s the Louisville Bats, Aroldis Chapman will probably not be in the bullpen. Bulls fans will remember Mr. Chapman as the guy who plonked Dioner Navarro with a 102 mph fastball and hit Dan Johnson with one that came in at only 99 mph. Chapman is up with Cincinnati and seems to have gotten a little better handle on his pitches — two appearances, two innings, six batters, three K’s, not bad. RaysIndex has a link to a Desmond Jennings interview. Happy looking/sounding young man. Brings up the point that, due to the lack of local media coverage, we really don’t get to see the Bulls up close very often. When the players move, so do their wives/girlfriends. Her Rays visualizes the Rays “new toys”. Here’s a question: When is Charlie Montoyo going to get called up? The unthinkable is thinkable, as Xavier Hernandez’ departure demonstrates. Charlie Montoyo is probably going to depart some day. Why not try to get some thoughts out there for us all to worry about? As readers will quickly notice, there’s a lot that I don’t know about how the process might work. So let’s see if we can make this something of a “plug and play” item. That is, I’ll put down some thoughts, leave some obvious holes, and folks can plug them for me — either by making a comment or by direct email, either way works. Just pick out one of the many “don’t know” statements below and jump in. We know about players going to the majors, often enough for the first time in September. But when does a championship-quality manager go to the majors? Probably not in September, but he does eventually leave. The basic circumstance is this: There really isn’t anything to be done in Triple A that Mr. Montoyo hasn’t done and done superbly. He has gotten the Bulls into the International League playoffs by winning the South Division Championship four years in a row. He has gotten them into the finals of the Governors’ Cup three years in a row and we are about to see how the fourth try goes. His team won the Governors’ Cup last year. 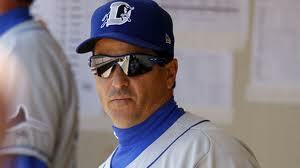 He was just named International League Manager of the Year. His won-loss record with the Bulls is 569 - 223 for a .568 winning percentage. In addition to getting his teams into championships, Charlie has managed or coached several international teams, all-star teams, futures teams, etc. That’s the teams, but minor league management has a lot to do with developing players. From the distance of where we sit in the stands, this also seems to have worked very well. Many of the Rays on the 2008 championship team and this year’s team worked for Montoyo before heading to St. Pete. 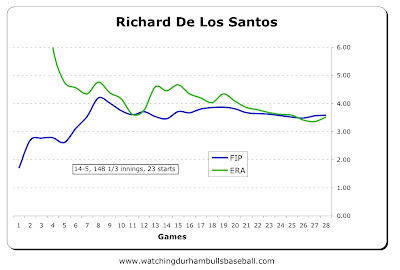 So you have to think that some day Montoyo is going to be packing his bag to leave Durham for greater challenges. Just how does that work? The basic answer is that I don’t know. It does seem like the front line major league managers come from among the manager/coach ranks of other major league teams. So the obvious first step is for Charlie to get “called up” to a coaching (e.g., bench coach, third base coach) position. Would that be with the Rays? Again, I don’t know how that works. I suppose that, like most folks in professional sports, Charlie is on a year-to-year contract. So I’d guess it to be unlikely he would jump ship in the middle of a year, but after the year is over, no idea. He’s been managing in the minors for 14 years, and, I think, has been with the Rays for his whole managing/coaching career. So it would make sense that if he’s going to move up, it would be within the Rays system. What happened in Seattle this year is very unlikely to happen in the Rays’ system. Is there a process for moving up in the Rays system? Again, I don’t know. I suppose the argument could be made, from the Rays’ point of view, that Charlie is making more of a contribution to the Rays by being in Durham that he would be able to make in St. Pete. And there’s quite of bit of merit to that argument, assuming that the compensation goes along with that view. If I were Charlie, however, I would suspect that that line of thinking comes mostly from folks trying to protect their jobs in St. Petersburg, not necessarily from those with his best interests at heart. And you’ve got to think that money has something to do with it. Does Charlie make more running the Bulls than he would coaching the Rays? Again, don’t know. Do coaches have agents? Don’t know. Do coaches/managers shop around with different teams? Seems that way, but not sure about that. 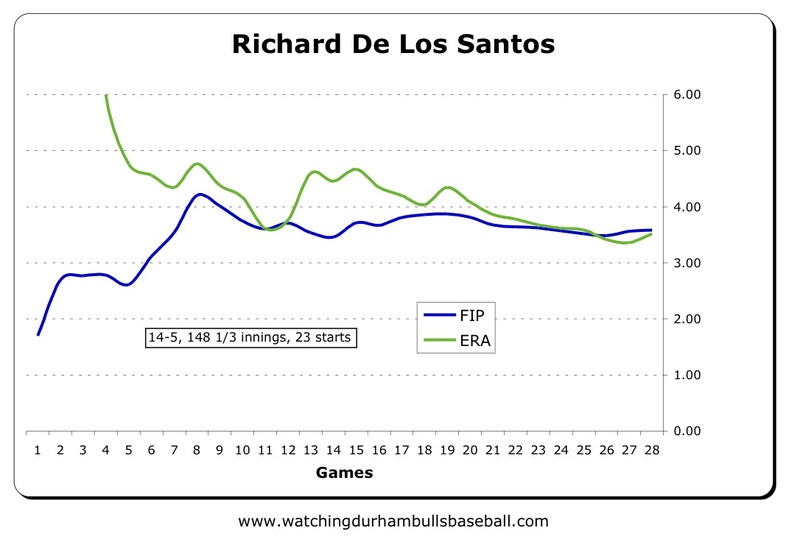 One thing for sure: Charlie Montoyo is too young and too successful to stay with the Durham Bulls much longer without some really good reasons. There you are. Of course, very unlikely we’ll see a September call-up. But will Charlie Montoyo be back for next spring? Jump in, especially if you’ve got a good link that explains how this sort of thing works. I've never even met Mr. Montoyo. All I really know about him is what I see from the stands. And I like that a lot. If it were up to me, I'd like to see him stay for years to come. Who else develops great players and wins championships the way he does?